Western Gulls in our wake. This year was my eighth annual New Years Day tradition of birding by boat, with San Diego Field Ornithologists, off the coast of San Diego. It was the 30th annual trip! We left out of Point Loma Sportfishing, aboard the Grande, at about 7:30am and returned at 2pm. Below is my GPS track for the day. We first headed southwest and then turned north up the ridge of Ninemile Bank. Then we headed straight at La Jolla till it was time to turn back. 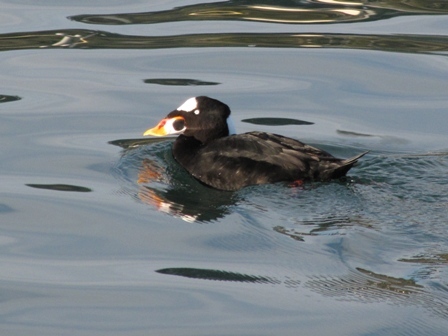 We had Red-throated Loon, Bufflehead and Western Grebe as we pulled away and Surf Scoter were common on the bay. I once heard that this bait barge is the longest running bait outfit in the states. I do know that they have been operating from this same spot for over 50 years. 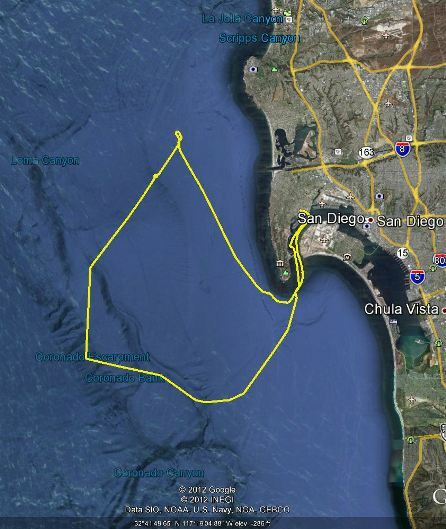 The Navy will be putting in a new fueling dock in this area and the bait docks are to be relocated farther in to San Diego Bay by 2014. 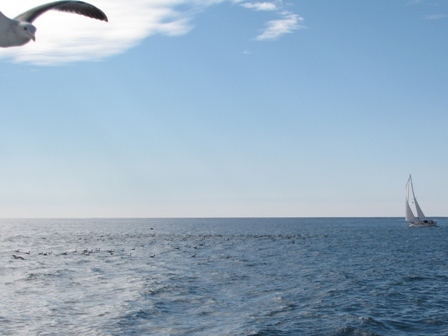 ALL pelagic birding trips swing close to these bait docks and often turn up some great birds. Not sure if that is in our future though. 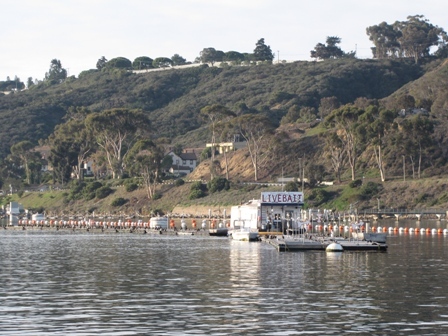 Everingham Bros. San Diego Bait Barge. 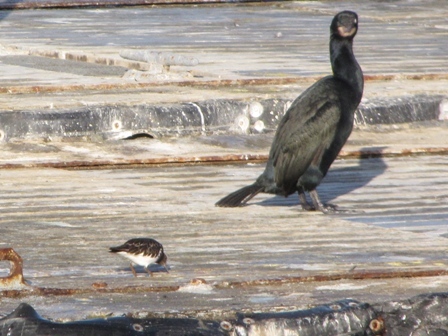 Black Turnstone (L) and Brandt’s Cormorant (R) on the bait barge. There were huge flocks of Western Grebe outside the bay and we were soon seeing huge numbers of Cassin’s Auklet and good numbers of Black-vented Shearwater. 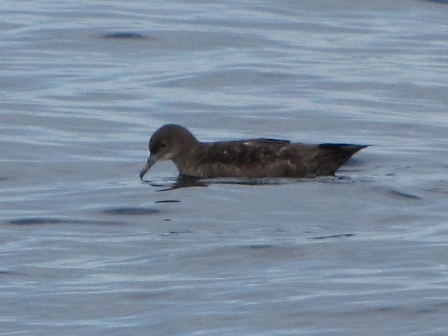 A lone Short-tailed Shearwater zooming past caused a stir but then finding three together, sitting on the water, and allowing the boat to cirlce closely THREE times was truly special! As we neared La Jolla we began to see many dolphins ahead. Sorting out what they were requires experience and I do not have enough of it out there to sort out most of the look alikes. 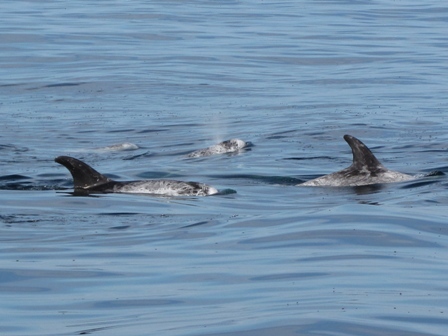 This small pod of Risso’s Dolphins stood out as they are quite unique! They seldom come into a boat to ride under the bow but many of the Bottle-nosed Dolphins came in and gave us a great show. You just lean up against the rail, look straight down, and they are racing along only a few feet below you. 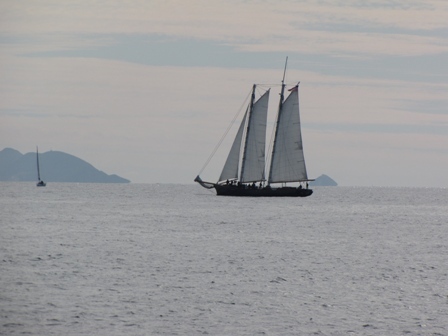 Two masted sailing ship with Islas Coronados on the horizon to the south. Mass quantities of Western Grebes! Western Gull, Western Grebes and sailboat. 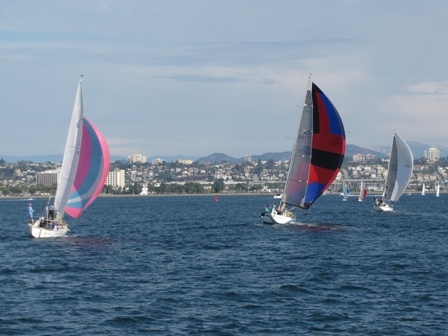 Mass quantities of sailboats on San Diego Bay. More and larger photos of the day, with picture locations mapped, will open in a new page on my flickr photostream at the following link. 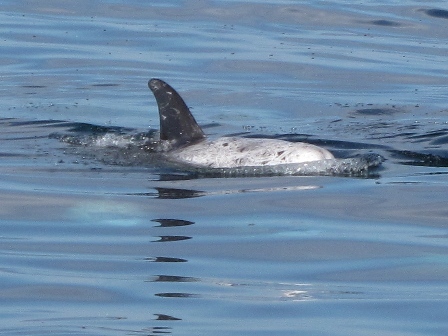 Also seen were Common, Bottle-nosed and Risso’s Dolphin, a small Blue Shark and a distant unidentified whale.